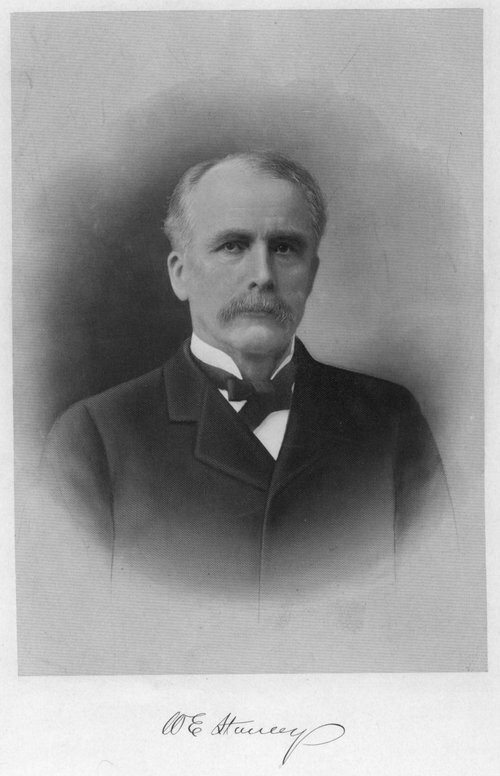 This black and white photograph shows William Eugene Stanley, (1844-1910). Stanley, a native of Ohio, settled in Jefferson County, Kansas in 1870 to practice law. He entered public service, in 1871, by serving as the Jefferson County attorney, (1871-1872). A few years later he became the Sedgwick County attorney, (1874 to 1880). In 1880, he made a political bid for a seat in the Kansas House of Representatives and served one term as a Republican from the ninety-second district, (1881-1883). Stanley resumed his political career in 1898, when he was elected the fifteenth governor of Kansas. He was also re-elected in 1901 to a second term. Stanley left office on January 12, 1903 to return to private life in Wichita, Kansas and to practice law. On October 13, 1919, William Eugene Stanley died at the age of 66. He was buried at the Highland Cemetery in Wichita, Kansas.